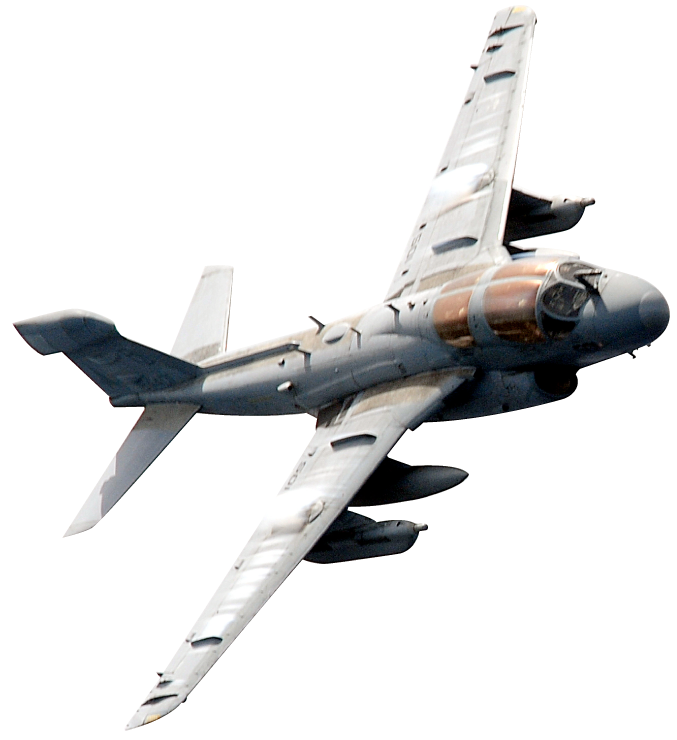 Mark McLaughlin and Arch Watkins met in the Navy flying EA-6B Prowlers. In different active duty squadrons, they were both stationed at the same base in at Naval Air Station Whidbey Island, in Washington state. After more than a decade of flying off of aircraft carriers and being stationed all over the world, they independently decided to settle down in the mid-Atlantic to focus on family, but ended up in the same Navy reserve Prowler squadron. Coincidentally, they were neighbors in Baltimore as well; Mark working in finance and Arch in engineering. With a healthy stint of travel and adventure behind them, sitting still in their new civilian desk jobs just wasn’t enough. Their shared love of whiskey and, at the time, a dearth of craft distilleries in Maryland led them to their true calling: starting their own distillery. In early 2015, Mark took the leap first by quitting his job and traveling to a distilling conference in Seattle to research how one gets into this new, exotic industry. While there he ran into Bob Stilnovich who was also at the conference, but for a different reason. It turns out that Bob was looking to sell his small, award winning distillery because his business partner, friend, and neighbor, Jim Cauldill was terminally ill. Bob, in his 70s was ready to pass the torch on one of the country’s first dedicated American Single Malt distilleries: Golden Distillery. Mark and Arch were working on a rye or a bourbon, but were intrigued by this new category. 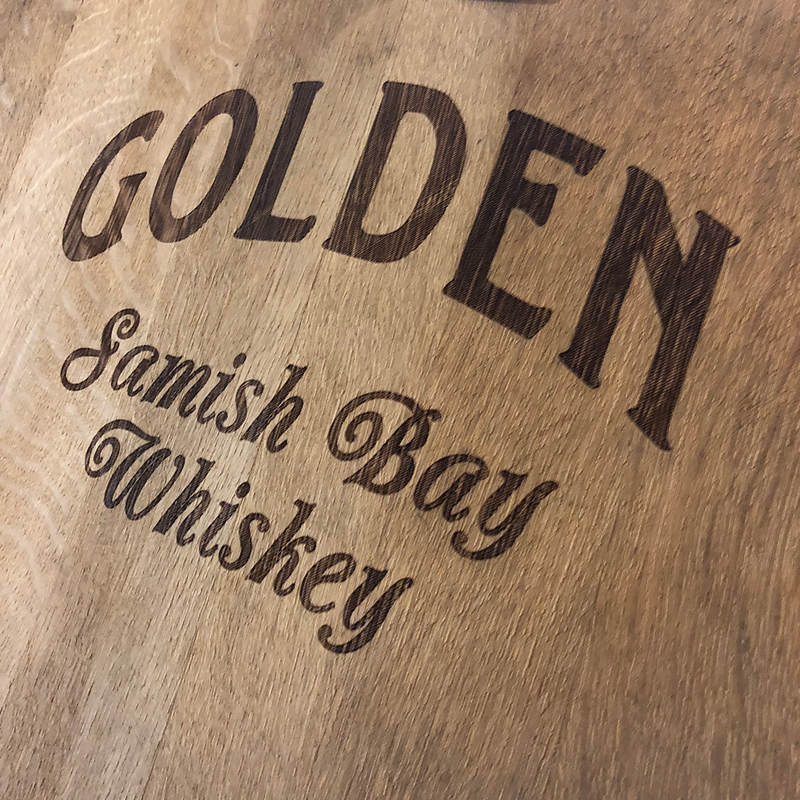 Golden Distilling was a very small producer located on a small spit of land jutting out into the northern Puget Sound called Samish Island. Run out of a barn on Bob’s property overlooking the Samish Bay, it was a picturesque location where one could see the Olympic mountains, bald eagles hunting, and whales surfacing in the bay all while making whiskey. Bob and Jim realized very early in the craft distilling resurgence that while bourbon was booming around the country, single malt whiskey was largely unexplored and ignored. Mark and Arch were hooked- and it didn’t hurt that Golden’s Samish Bay Single Malt won best-in-class at the 2012 American Distilling Institute! So in early 2016, they moved out to Samish Bay, stayed in Bob’s guest house, and started the process of learning how to distill the country’s best American Single Malt. From 5 am to 10 pm six days a week they made whiskey and filled barrels. Bob instilled in them not just the process for making the whiskey, but a respect for the fundamentals: patience, use of quality ingredients no matter the cost, and attention to detail. On Fridays, they filled bottles from a mature barrel and on Saturdays folks would drive two hours up from Seattle to buy everything off the shelves. When they could do it with their eyes closed, they packed everything up, and started the long trip back to Baltimore. Old Line Spirits was finally alive, but there was still lots of work to be done. Though Mark and Arch had the distilling knowledge of making American Single Malt under their belt, had many barrels of the whiskey, and the equipment to make it on a very small scale, they were still lacking a distillery location in Baltimore. Old Line also needed to navigate the regulatory bureaucracy as well as raise a few bucks to help get things started. However, Old Line couldn’t wait the year or so that it would take to get everything in place and, just in time a solution presented itself. A friend introduced Mark and Arch to two other owner/distillers, Ryan and Brady of Middle West Spirits located in Columbus, OH. After eight years producing award winning bourbons and vodkas, Middle West was making the leap to expand production capacity and was looking for other, smaller distilleries to help take up some of the early year excess. The head distiller, Ryan, was intrigued by Old Line’s American Single Malt and liked what Old Line was about. 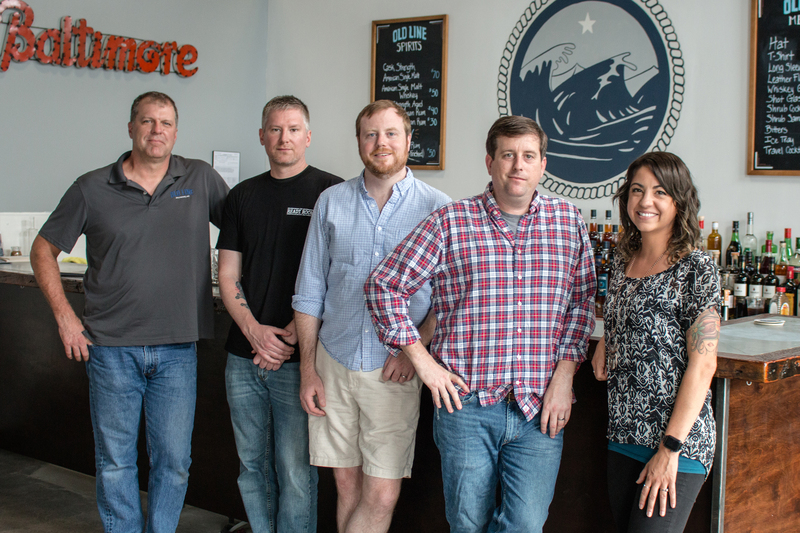 The four owner/distillers hit it off and a partnership was formed. For a year, Mark and Arch traveled to Middle West to make their American Single Malt with Middle West’s equipment. Though they learned the basics of distilling from Bob at Golden, it was Ryan that mentored them with more advanced distilling skills. After a year of traveling out to make whiskey in Ohio, Mark and Arch felt that the distillers at Middle West had a great grasp of the Old Line process, were experts at making whiskey in general, and they decided to turn over production to the Middle West team. Now they travel out for every production run to check on quality, to learn from Middle West’s distillers, and to visit with their friends. 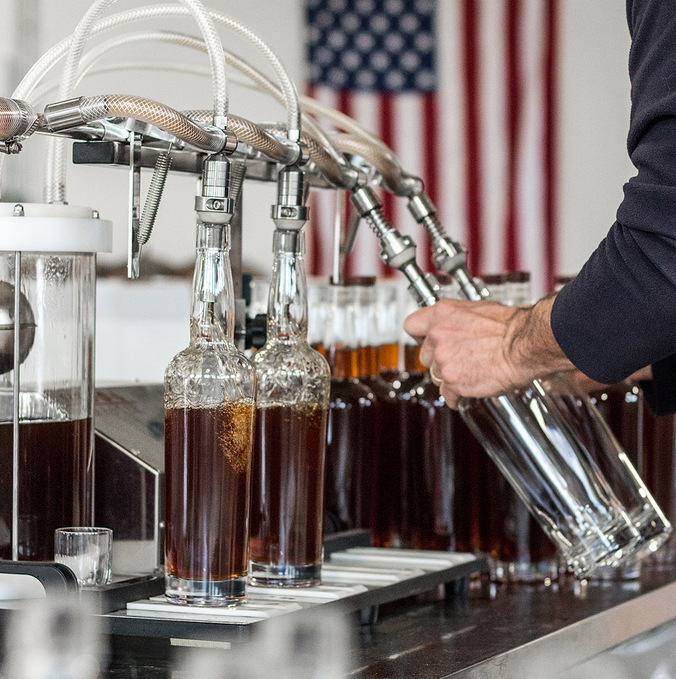 Rest assured, every drop of Old Line’s American Single Malt whiskey is made with the same attention to detail and focus on the highest quality ingredients that goes into the product in Baltimore. When Mark and Arch weren’t at Middle West making whiskey, they were also hard at work back home in Baltimore. First and foremost, an adequate location was needed for the distillery. Big believers in Baltimore, they knew that they wanted an urban/city distillery. They also wanted it close to home so that they could work the long hours necessary and not have a long commute to worry about. That narrowed things down to east Baltimore. After their original location selection fell through due to a lack of necessary plumbing, they stumbled across the perfect building in the Highlandtown neighborhood. A former commercial laundry facility, it had all of the necessary bones for a distillery, was located next to the interstate, and was an easy five to ten minute drive to many great city neighborhoods. At 25,000 square feet, it was the perfect size for Old Line to grow into with enough space to hold hundreds of barrels and host events. It even had 5,000 square foot courtyard perfect for an outdoor space. Securing the lease took a little longer than they anticipated, but they finally settled in in the fall of 2016. It turns out there are a lot of regulations and laws governing distillery operation at the city, state, and federal level- and they all needed to be worked through. So while the real estate piece was being worked, Mark and Arch tackled the various licensing requirements needed. And of course… the ever need for more money. 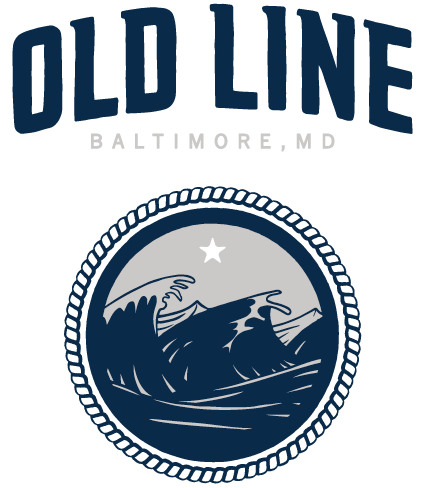 Finally, in February 2017, Old Line Spirits opened its doors to the public with great support of friends, family, and the Highlandtown neighborhood. Since then, its grown bigger by adding more barrels, installing a brand new still system, and, most recently, opening Maryland’s first full beer, wine, and spirits cocktail bar in a distillery, The Ready Room. Old Line started with its flagship American Single Malt Whiskey, but never content to stay still, Mark and Arch quickly released other products that kept with their philosophy of high quality spirits that are unique: the very limited Peated American Single Malt, the Cask Strength American Single Malt, and a line up of Aged Caribbean Rums (you can read about those in the Spirits section). Our next spirit release will be our single malt finished in sherry casks- look for that in autumn 2018.